A fun health and fitness app with a built-in Life Coach! Lets me record my weight and measurements. Lets me record eating and exercise. Gives me emotional support. The built in Life Coach is always in my pocket. She's always there when I need her. Shows my progress anytime at a glance. 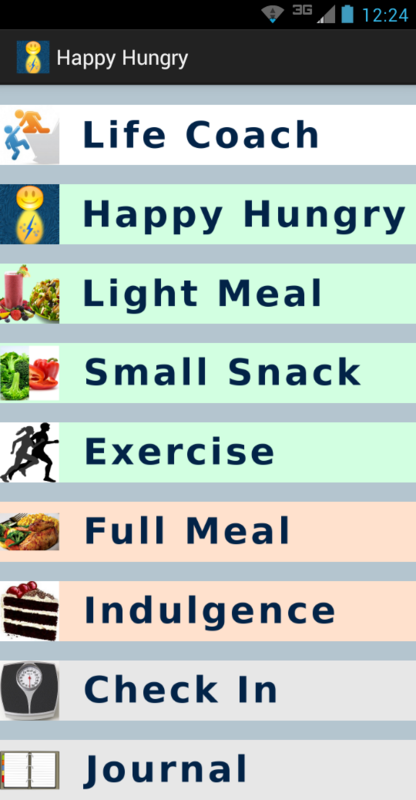 Happy Hungry is a new kind of health and fitness mobile app! If you want a fun app, that doesn't take much of your time, this is the app for you. Happy Hungry has a Life Coach built right in! All of the responses, support, and encouraging words are from a certified Life Coach. "You don't have to count calories in order to lose weight." There are many other apps available to help you lose weight. Usually, they require you to put a lot of time and effort into the set up, and into the daily input. There is no set up. You tap things in when you want to. The Journal gives you feedback. The built in Life Coach chimes in and gives you support. Click here to download the Free Edition for Android smartphones and smartwatches. Click here to download the Free Edition for Android tablets. The "Access to Internet" permission must be accepted in order to install this app. 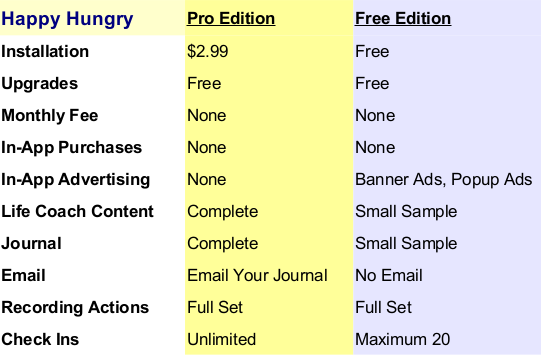 The Pro Edition needs it to Email your Journal, and the Free Edition needs it to show Ads. Yes, you can install and use this app on any Android powered wrist watch, and on any other wearable device, meeting the above requirements! BlackBerry 10 users can use the 1Mobile app to search for Happy Hungry and install it. coming soon: BlackBerry 10 native version "Built For BlackBerry"